Prime Minister, probably the most Hon. Andrew Holness greets (r-l) Professor Dale Webber, Principal, University of the West Indies (UWI), Mona; Dr. Taleb Rifai- former Secretary General of the US, World Tourism Organization; Minister of Tourism, Hon. Edmund Bartlett; and Ambassador Dr. Richard Bernal, Pro-Vice Chancellor, Global Affairs, UWI, Mona. Speaking to the 200 delegates attending the Tourism Resilience Summit of the Americas nearly, Jamaica Prime Minister, probably the most Hon. Andrew Holness, challenged them to invest in finding common answers to tourism resilience through synergies to lessen the risks and diminish the threats to the tourism industry. The Prime Minister was giving the keynote address at the inaugural summit today (September 13) at the University of the West Indies’ Regional Headquarters, Mona. Noting that the Caribbean and the Americas remain probably the most tourism-dependent region in the global world, the Prime Minister said that despite favourable visitor statistics the tourism industry remains the most vulnerable industries. “Tourism is vulnerable not merely to natural disasters but additionally to man-made disasters in addition to a group of other external shocks. A number of the main threats to the tourism sector include climate change, pandemics and epidemics, cybercrimes, political terrorism and instability,” he said. He said that in light of the threats he was very happy to endorse the establishment of a worldwide Resilience and Crisis Management Centre to be housed at the University of the West Indies, Mona Campus that is paramount to ensuring agile, robust and coordinated decision making, resulting in strategic and focused implementation. Minister of Tourism, Hon. Edmund Bartlett, says he believes that the steps being taken at the Tourism Resilience Summit of the Americas will shape the continuing future of resilience building in your community. 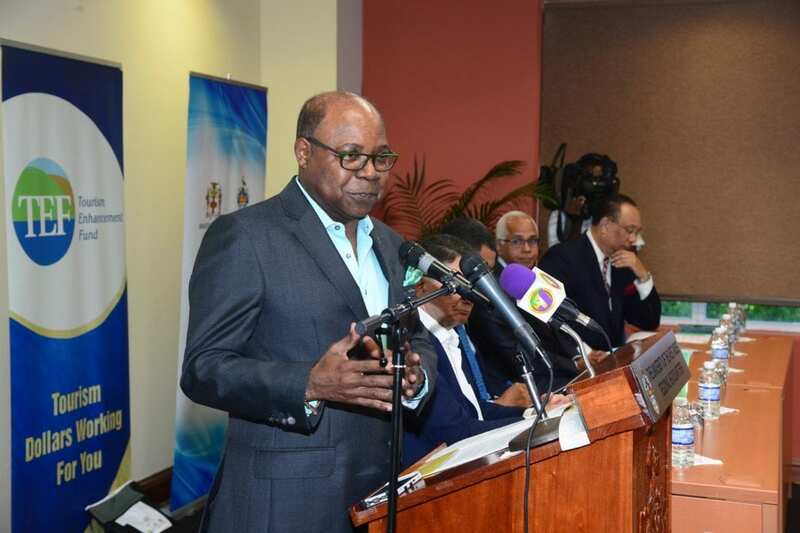 He was giving the welcome at the inaugural Tourism Resilience Summit of the American today (September 13) at the University of the West Indies’ Regional Headquarters, Mona. The Tourism Minister noted that bridging and building resilience among our stakeholders through innovative strategies, capacity and training building; and communicating resilience will be the critical next steps to giving an answer to these disruptions. “I really believe these initiatives allows us to become innovative and through this innovation won’t just adapt but thrive in the onset of the global disruptions,” he added. Under the theme of “Tourism Resilience through Global Synergies”, the summit forms area of the Ministry of Tourism’s efforts to create resilience in a worldwide world that’s hyper-connected and, therefore, is more vunerable to events that disrupt tourism, such as for example climate change, epidemics and pandemics, cybercrime and terrorism and natural disasters. Headline speakers on climate challenges and crisis management include Professor Lee Miles, Disaster Management Centre, Bournemouth University, UK; Professor Aldrie Henry-Lee, Director of the Sir Arthur Lewis Institute of Social and Economic Studies (SALISES) and Dr Barbara Carby, Director of Disaster Risk Reduction Centre at the University of the West Indies. Other discussants are former US World Tourism Organization (UNWTO) Secretary General, Dr Taleb Rifai; Director of the National Tourism and Travel Office, U.S. Department of Commerce, Isabel Hill; and former UNWTO Executive Director Carlos Vogeler. The summit is really a precursor to the state 2019 launch of the Global Tourism Resilience and Crisis Management Centre that was among the major outcomes of last November’s UNWTO Global Conference on Sustainable Tourism in Montego Bay. Its mission would be to perform policy-relevant analysis and research on destination preparedness, recovery and management from disruptions or crises that impact tourism and threaten economies and livelihoods globally.